Disclosure: This post is sponsored by Plaid Crafts. 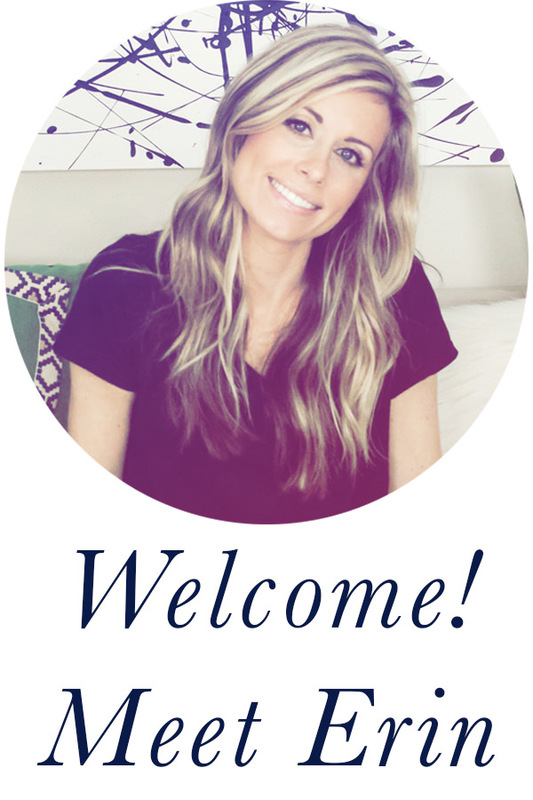 As a member of their team of Plaid Creators, I’ll be bringing you fun craft ideas each month! All opinions are my own. One of my favorite things about crafting is the fact that it brings people together. 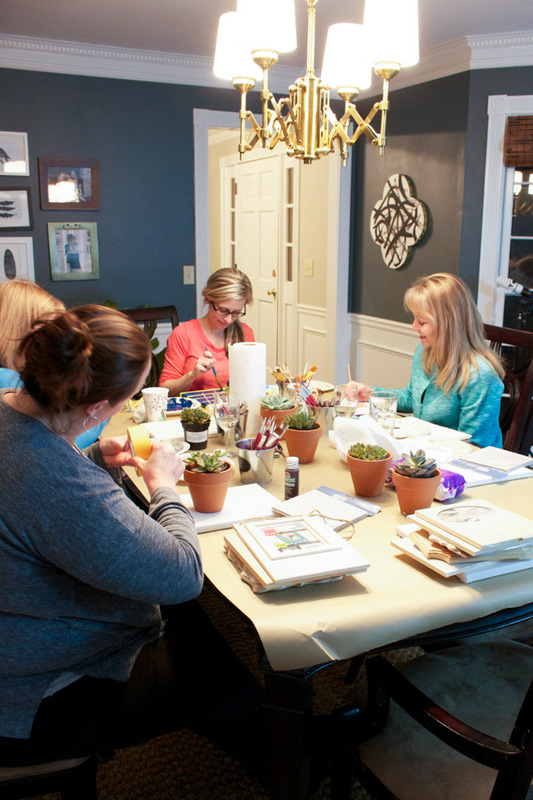 A shared love for creativity has sparked so many friendships in my life, and bonding over crafts is one of my favorite ways to connect with others. 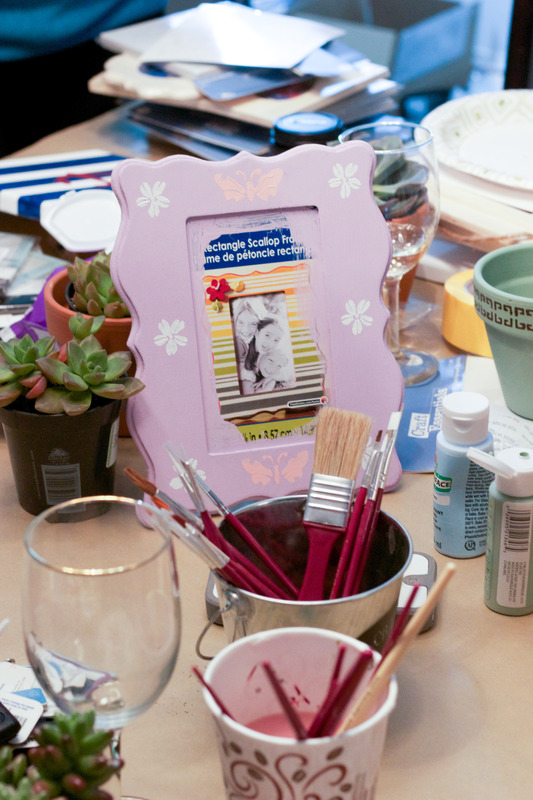 A great way to do this is to have a girls’ craft night, and I recently hosted one at my home. It was a small gathering with just a few friends, but it was the perfect opportunity to unwind and have fun. I thought I would share our fun evening with you, along with my 5 tips for hosting the perfect craft night. 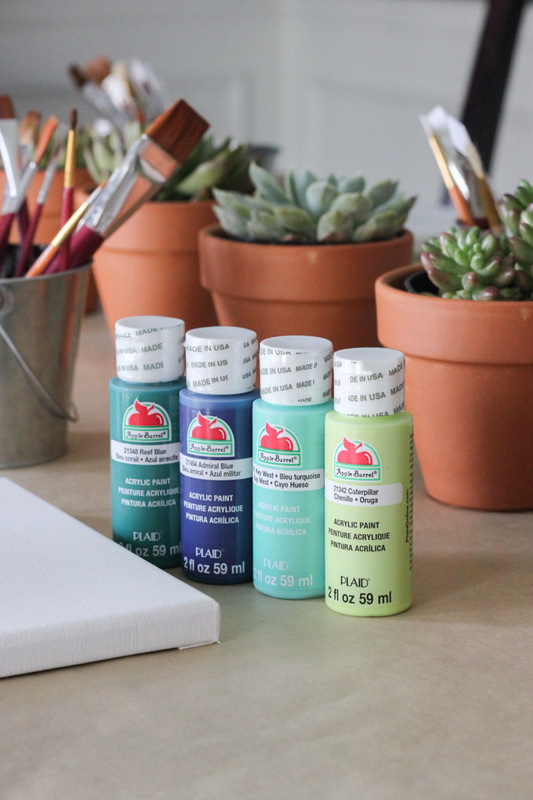 We used Apple Barrel® paints for our projects, and I made sure to have every color under the sun available. My dining room buffet served as the perfect “home base” for all of the paint. Guests could choose their colors and fill their palette (just a paper plate) as needed. 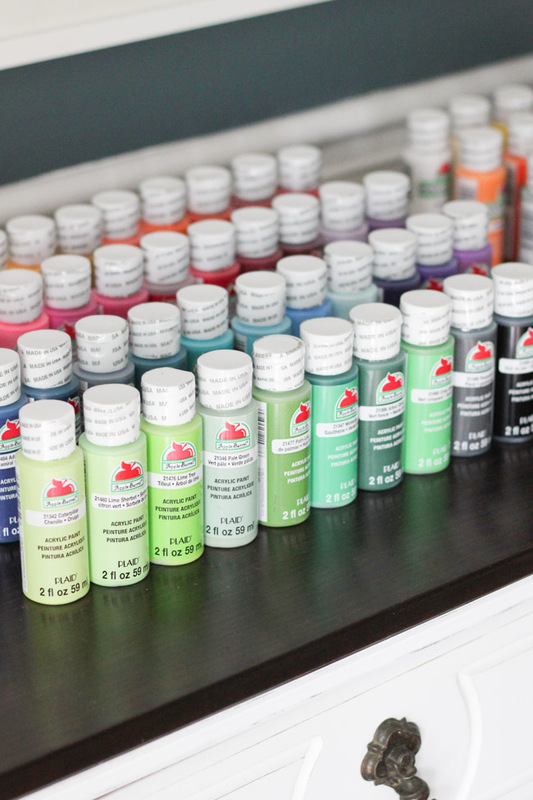 I love Apple Barrel paints because not only are they super affordable, but they’re also water-based and easy to clean up with soap and water. (A must, especially if you’re crafting with kids!) It’s also certified AP non-toxic and made in the USA. It comes in regular, multi-surface, and gloss finishes and you can find a large selection at Wal-Mart. 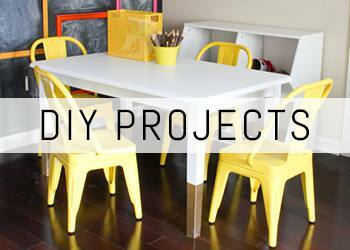 When you host a craft night, keep the project (or projects) somewhat simple. Since your guests may have a variety of craft experience levels, you don’t want to do anything too advanced, complicated, or intimidating. For our craft night, I opted to have 3 different projects to choose from. 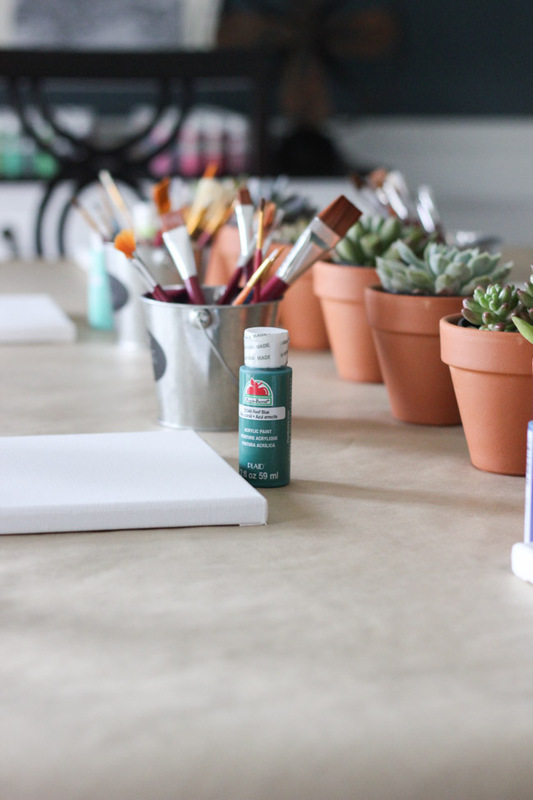 We painted terra cotta succulent pots, painted and stenciled canvases, and painted plain wooden picture frames. (The frames are from the Plaid® Wood Surfaces line.) Guests could choose to do any or all of the projects. All of these projects were easy, but could be customized according to guest’s experience level. It just so happened that two of my guests were actually artists, so it was fun to see what everyone came up with! Your decor doesn’t have to be extravagant or fancy—quite the opposite actually! In my opinion, everything about craft night should be low-key. I incorporated the project supplies into a tablescape, so while it looked decorative, it actually functioned perfectly for the event. Everything was out in the open, and easy to find and access no matter where people happened to be sitting. The “tablecloth” was actually brown craft paper intended to protect the table from spills and messes, but it also made sense for our crafty theme. 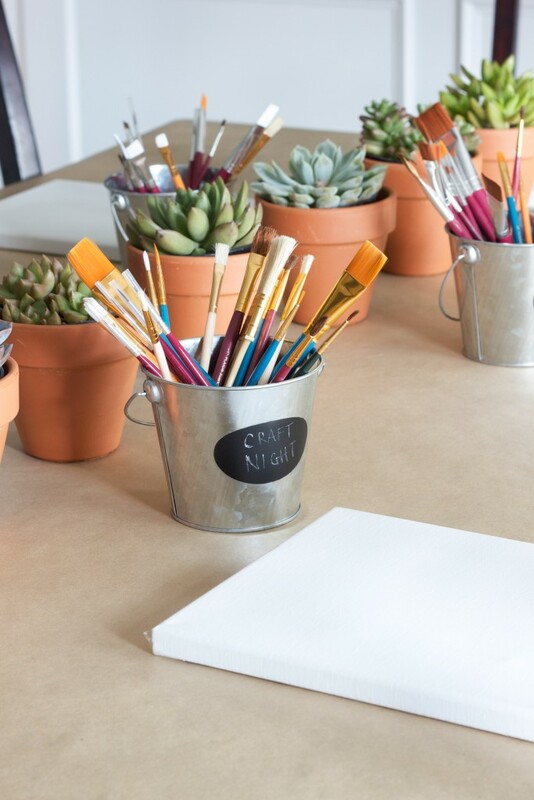 Each guest had a bucket of paint brushes nearby, a succulent pot within reach, and a canvas at each place setting. This is kind of a no-brainer for any get together. People like to eat and drink while they socialize, so I definitely recommend having some snacks and beverages available. I just had light snacks since our craft night was after dinner—some hummus and crackers, salmon dip and chips, cookies for something sweet, and then drinks. I think it’s always fun to learn a new crafting or DIY technique, but it’s so much more fun to be able to take something home with you. While my guests all took home the crafts they made, I had a succulent for each of them to fill their terra cotta pots with too as a special “thank you” for coming. 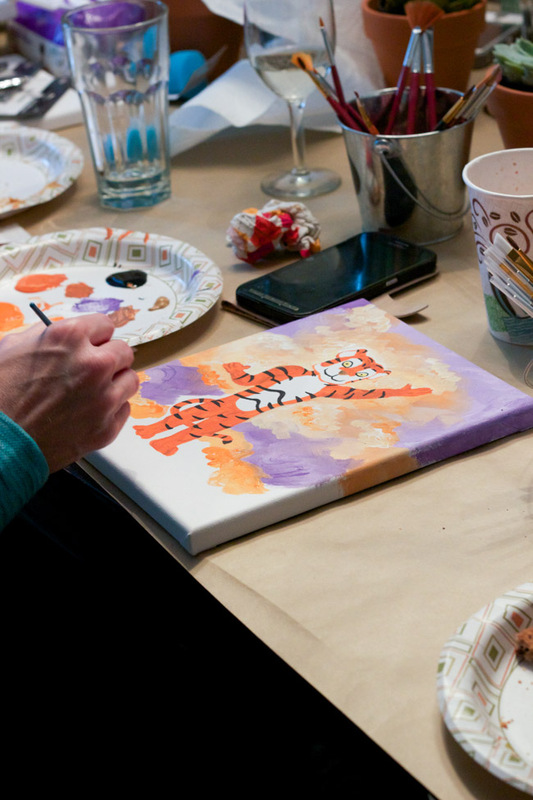 Ultimately, craft night is just a fun opportunity to make memories. My craft night was incredibly casual and low-key—I even wore my pajamas! There was no pressure, just fun. We could chat about life and decompress after a stressful day of “mommyhood,”and pour our energy into creating something fun. I think the true measure of success when it comes to the perfect craft night is whether or not everyone had fun and ended up feeling relaxed. Crafting can be very therapeutic in itself, but coupled with a social gathering of friends, I think it’s the perfect release from the stresses of everyday life. For lots more project ideas and inspiration, be sure to sign up for the Plaid Newsletter, and connect with them on Facebook, Pinterest, and Instagram. 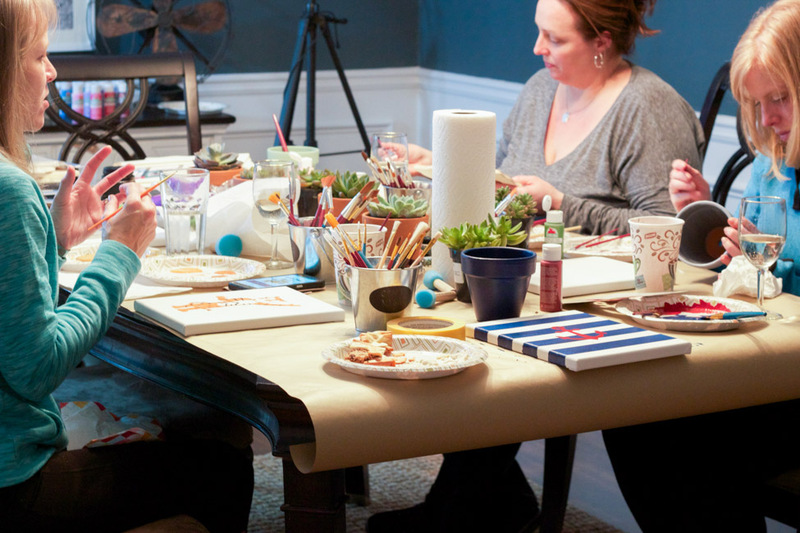 What are your tips for hosting the perfect craft night? I’d love to know! 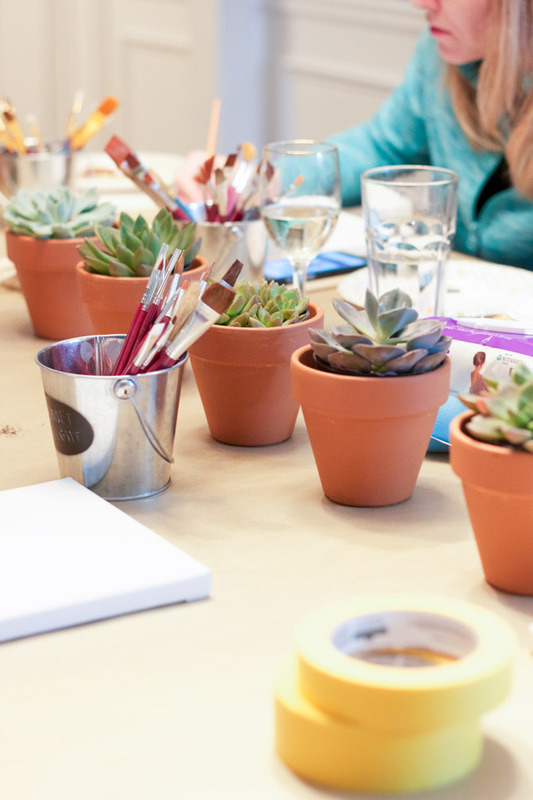 Do you charge for your craft parties? If so, how do you calculate the price, please? Hi Sue! No, I don’t charge. This was just a fun girls’ night in with friends. I provided the supplies, with the help of Plaid Crafts, for this party, but normally we just each buy our own supplies and bring them. Sometimes one person will buy them all and each friend reimburses them for their share. Love these tips, Erin! I’ve hosted two of these recently and my friends have absolutely loved it. 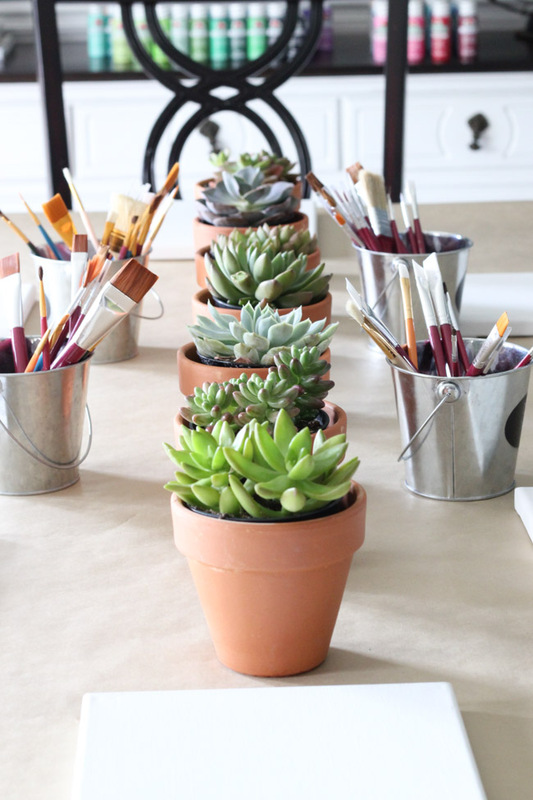 I’m going to steal your idea of the paintbrushes in little buckets…too cute! 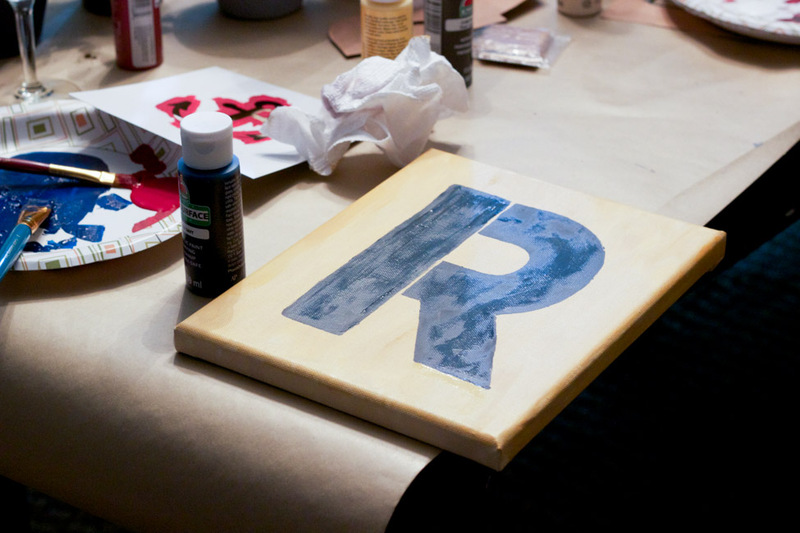 We painted wooden signs this month, and last month did hand lettering. It’s so much fun to do things like this for a girls’ night! How fun! I absolutely love craft parties of course . . . I like it when people bring big bags of their crap and trade and play. Ha! I actually like swaps too where people bring stuff they want to get rid of or no longer need. It’s fun! Thank you Amy! 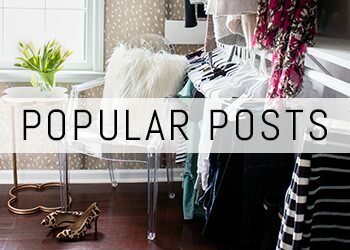 I love the idea of a craft supply swap! I definitely need to do one of those. Such a fun idea! Thanks for all the tips. I love that picture with all of the rows of paint lined up! This looks like a fun night! I need to plan one. Thanks for the great tips. Thanks KC! It was fun! Those paints! Such amazing colors. What an awesome party! Thank you, Claudia! Good luck with the home buying process! Hope you find one you love.